Have a fully automated inventory and detect empty shelf space automatically. interactive robots are operating all around the world. Inventories cost a lot of time and require a lot of staff. The mobile service robots TORY and TORY to go by MetraLabs make it possible to take stock around the clock, frequently and automatically. The reading accuracy is 10 times that of a manual inventory. Shoplifters cause damages worth billions every year. Mobile robots support surveillance. They serve as mobile cameras and provide a better overview. The robots deliver images from different perspectives and send them to the control center. Remote control is possible, too. All of this improves security substantially and reduces damages. Competing with the online business, retail can satisfy customers with individual advice and products they can touch. The use of mobile service robots for selling increases the entertainment value. 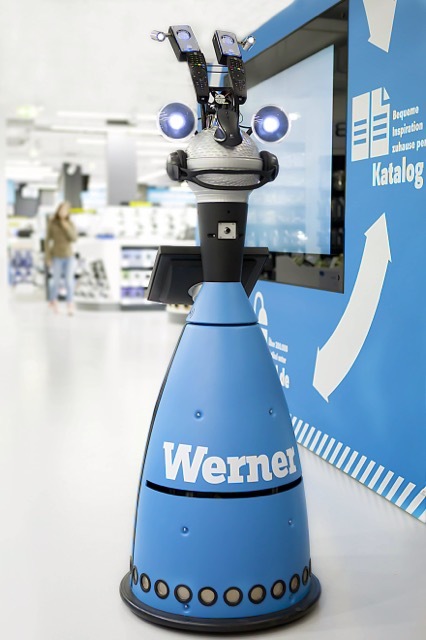 Our robots guide customers to products and interact with them. The result is a modern, customer-oriented image. Thus, shopping becomes an adventure! Missing goods cause loss in sales. The inventory robot TORY by MetraLabs optimizes the availability of goods. TORY captures the actual stocks and feeds data to your merchandise management system, enabling you to reorder just in time. We know the latest trends in retail and actively co-create the future of robots with the people running the floor. Since 2017, MetraLabs has been partner of the EHI Robotics4Retail initiative. It is a platform for providers, developers and users of robots in retail to exchange knowledge and to evaluate new applications in retail. TORY takes stock via RFID – fully automatically and efficient. TORY is characterized by secure and autonomous navigation.